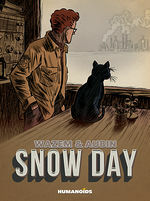 "Steeped in cold and contrast, Snow Day uses a backdrop of forgotten, small-town America to provide commentary on universal struggles of the heart." The shifts in style engross the reader in Spencer’s psyche while capturing a feeling of authentic frigidness, making Snow Day a surprisingly immersive read despite its apparent simplicity. Snow Day is the perfect read for a cold winter day. Its protagonist is calm, reserved, and determined in a way that’s interesting and compelling. You’ll read this wondering if real life is really like this in small towns. Snow Day is a quick read, but one that is very enjoyable. It wasn’t the most original story, but it’s so well-crafted that it shines above that. If you’re looking for a beautiful story that’s well told, then look no further than Snow Day. A thoughtful, largely wordless work in which not much happens, the strength of this piece lies in the stark, realistic depictions artist Aubin gives of the narrative’s utter mundanity. The story by itself is fantastic and is a bit more artsy and philosophical take of a classic story of a sheriff rooting out corruption.